Two Galaxy Notes and two Optimus Vus later, LG's ready to tackle the giant-sized smartphone niche, this time without the category's defining accessory: a stylus. The Optimus G Pro, part of the company's performance line, was a surprise when we first laid eyes and hands on it: it's a 5.5-inch embodiment of lessons learned, not just from LG's past endeavors, but also from Samsung's. That the device would ever make it out of South Korea and into the US was an uncertainty. And by entering the market now, the G Pro risks coming off as a stopgap between the Note II and III, as well as LG's own flagship G line. Yet, LG found a way. It paired with AT&T to bring the G Pro, with its Snapdragon 600 processor and 1080p display, to the States as an exclusive. For $199 on a two-year plan, subscribers get an attractive package: LTE, NFC, 32GB of storage (expandable by up to 64GB via microSDXC), a gargantuan 3,140mAh battery and dual 2.1MP / 13MP cameras with the option for dual-recording. So, aided by some competitive pricing and top-shelf specifications, the G Pro reads on paper like a boss. But the window for that dominance is short. So while we wait for Samsung to attempt a three-peat in the category it created (a Note III could debut by summer's end), let's examine the G Pro and its 15 minutes of fame. Its winning mix of size, specs and price makes the LG Optimus G Pro a smart buy for AT&T customers seeking a Note II alternative. The hardware is essentially the same, both inside and out. At 150.2 x 76.1 x 9.4mm (5.91 x 3.0 x 0.37 in.) and 6.14 oz. (174g), the G Pro's dimensions have remained unchanged. It's almost as if carriers are waking to the growing chorus of consumers who crave smartphones designed by manufacturers, not the wireless providers themselves. Of course, AT&T has made some minor customizations, like the globe on back (the only instance of carrier branding on the shell), along with compatible radios for HSPA+ and LTE. Also, AT&T is only issuing the G Pro in black. We'd whinge about the foolishness of that last decision, but you need only look back at our original review to see how the G Pro sparkles in a white shell (literally). Users who pick up a G Pro will immediately notice how comfortable it is in-hand relative to its size. This is due to the reduction in bezel size, as well as the blunter edges. What's more, the G Pro may be all plastic, but it manages to almost entirely avoid the slippery feel of the Note II. The backplate, covered in an unattractive patterning, is also removable, giving way to slots for micro-SIM and microSDXC (to complement the 32GB of inbuilt storage), as well as the 3,140mAh battery. As a conversation piece, this variant of the G Pro won't ever win props for its looks, but that 5.5-inch 1080p screen (400 ppi) is a different matter entirely. The full HD IPS display is simply gorgeous. Colors are balanced, the whites are bright and, thanks to the panel used, the screen is viewable from most angles. If you're using it outdoors, however, you'll still want to bump up the brightness. Right-handed users will feel especially at home using the G Pro since its button layout works best when used that way. Along the left edge you'll find a hot function key and volume rocker with the power button on the opposite edge. Up top is the 3.5mm headphone jack and IR blaster, below which is the 2.1-megapixel camera. The standard micro-USB port resides at the base and an LED-ringed home button, surrounded by capacitive keys, flanks the lower half of the screen. Smartphone junkies will be pleased to know that the G Pro still packs a Snapdragon 600, clocked at 1.7GHz, and paired with 2GB of RAM. That combination makes every moment with the G Pro an absolute delight -- there are no hangups, no awkward moments of stuttering or force closing. It performs as a phone of its caliber should: effortlessly. The only obstacle on the G Pro's path to pure ease-of-use is LG's hot mess of a UX. 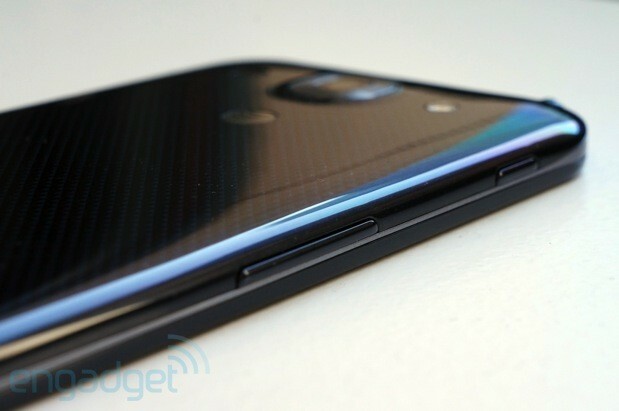 The company claims this version of its Android skin is cleaner, but it's not. Admittedly, the icons come off as less cartoony and users do have the option to super-size them for easier viewing, but the overall implementation is just too clunky. Take, for example, the drop-down notification tray. It's so cluttered with toggles that even after a few days of use, we still had to search for the cogwheel that denotes the settings icon. Which brings us to yet another point of frustration: the settings menu. For some reason, LG decided to abandon the single-pane view and opted instead to divide key submenus across panes much the way Samsung did on the Galaxy S 4, all accessible with a swipe gesture or via tabs. It may sound convenient, but it's not. It branches off from the Android experience as we know it and introduces one more unnecessary learning curve. On the app front, you're looking at a dozen pre-installed AT&T-branded applications (i.e., Navigator, Smart WiFi, MyAT&T, Locker, Messages, etc.). The good news is that some of this unnecessary bloat is uninstallable, but it's pretty random. There's a good chunk that you can only disable, effectively hiding those applications from view, which is better than nothing, but far from ideal. By contrast, LG's additions seem downright tame -- the bulk of its add-ons mostly involve baked-in Optimus UI features like QSlide 2.0 (for split-screen multi-tasking), QuickMemo (for on-the-fly note-taking) and VuTalk, a screensharing function currently exclusive to the G Pro. Without question, the G Pro's 1080p display is a leg up on the Note II's relatively paltry 720p HD Super AMOLED. But there is a downside to this that not even the generous 3,140mAh battery can mitigate, and that's its staying power. 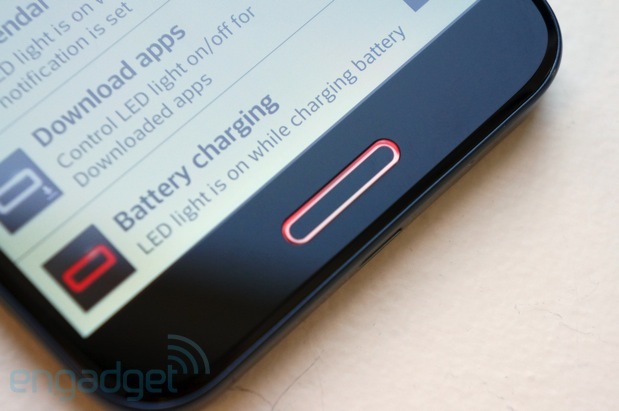 Those extra pixels create more of a strain on the battery. It can yield more than a full day's use, but not the phenomenal two day's worth we've enjoyed on the Note II. And it's not like we sat around watching YouTube videos all day -- this was with regular light browsing, moderately obsessive Twitter monitoring, emailing and texting. It's worth noting, however, that LG has included a power-saving option in addition to a battery-saving toggle to specifically ramp down the demands of the quad-core CPU. The G Pro didn't fare so well under the stress of our formal battery rundown test. With an HD video running on a constant loop, brightness set to 50 percent, one push email account active, WiFi / LTE enabled and Twitter set to sync at 15-minute intervals, the handset managed to last six hours. That's hardly a promising figure, but it's definitely an indication of how closely you'll need to manage the G Pro's battery life. As you might've guessed, LG's decision to keep the G Pro's specs in line with its Korean counterpart means parallel performance. Benchmark testing delivered results more or less on par with the Korea-only G Pro, though its scores in the graphics tests GLBenchmark and CF-Bench fell short of what we saw on the HTC One. 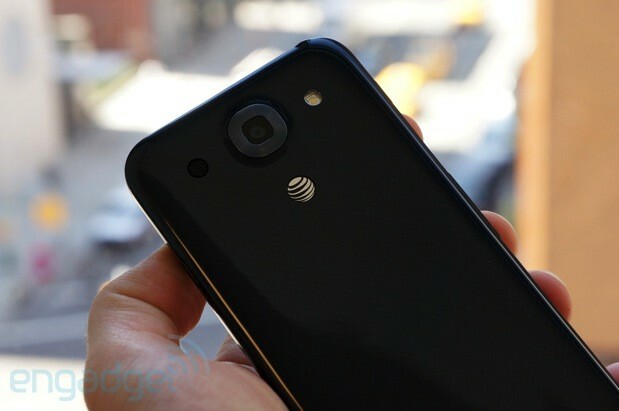 There are two unavoidable truths about the AT&T G Pro: it's $100 cheaper on-contract and better specced than AT&T's Note II (hello, Snapdragon 600!). 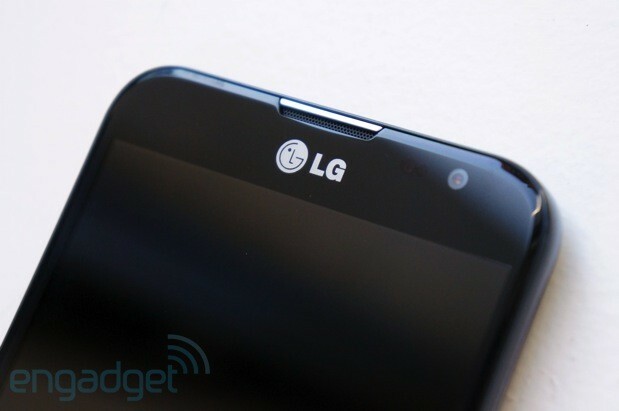 For what LG's crammed into its oblong shell, the G Pro really is a bargain for power users. But it has one ugly mole (no, not that AT&T globe) that not even its stunning 1080p display can overshadow, and that's its less-than-stellar battery life. True, it's an improvement from what you'd get from the GS4 or HTC One. Even so, in South Korea the Optimus G Pro comes with an extra battery in the box, and that's sadly missing on the US variant. CPU power and high-res beauty come at a cost -- whether that's to save you money or keep you on a constant hunt for power outlets is your choice to make.